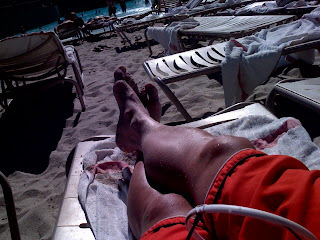 I spent the afternoon at the Mandalay Bay Beach. It was my first experience in the famous wave pool. At first I was a little nervous about the wave pool especially, I'm not a good swimmer. So, I hung around the edge just soaking water around my knee level. Boy, that was a mistake. I got hit so hard by an end of a wave, it knocked me down and I almost passed out. It's like getting whipped by a gigantic wet towel. I was later suggested to move near the "blue" line by a life-guard. And sure enough, the wave is much more gentle there (middle of the wet towel) and it pushed me back 15 ft to shore. I rode this wave for about an hour with my water proof iPod housing and ear phones. I can't wait to do this again next year. On a side note... the Mandalay Bay Hotel recently revamped their facilities which includes their famous man-made beach. They now have a beach side restaurant and on the top floor of the new structure by the beach, a mini-casino. Who in the world would be tempted to gamble during a fun time at the beach? I walked in, it had a black-jack table, roulette, craps, and it was empty. The dealers were just standing around watching the game on the flat screen tv.